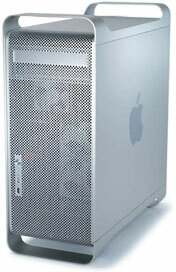 2007 – Primate Labs picked up a copy of OS X Leopard and posted the first Geekbench results for the iMac (2.0 GHz Core 2) and Power Mac G5 (single 1.6 GHz) on Saturday. Leopard was tested in both 32-bit and 64-bit modes and compared with OS X 10.4 Tiger, which is strictly a 32-bit operating system. We’ve been used to receiving better performance as Mac OS X evolved from the Public Beta through version 10.3. That ended with Tiger. And with Leopard, if these benchmark results are a fair indicator, there’s a real performance hit. Overall performance results for the Power Mac G5 with 1.25 GB of RAM shows Tiger as fastest with a score of 1013, 32-bit Leopard in second place (over 10% slower at 898), and 64-bit Leopard trailing that by an additional 5% (853). 64-bit Leopard tends to lag because 64-bit commands are larger and thus take longer to load under PowerPC architecture. Looking at different components of the overall score, stream performance under 32-bit Leopard is better than under Tiger (by about 7%), but 64-bit Leopard is slower than Tiger. Memory performance is almost identical for 32-bit and 64-bit Leopard, but about 7% behind Tiger, and floating point performance is best under Tiger, with 64-bit Leopard 5% behind and 32-bit Leopard 5% slower than that. In short, for best performance, PowerPC Mac users should stick with Tiger, and if you want to run Leopard on a G5 system, the additional overhead of a 64-bit OS seems to offset any advantage. As widely expected, Leopard appears to be optimized for the Intel x86 architecture. 32-bit Leopard is overall a bit slower than Tiger (on the order of 3%), and 64-bit Leopard is the speed champion overall (6-7%) and in three of four benchmarks. Looking at specific benchmarks, 64-bit OS X 10.5 is 15% faster than Tiger for integer performance (32-bit Leopard is about 2% slower), 5% faster for floating point math (32-bit Leopard trails by 3%), and 5% faster for stream performance (with 32-bit Leopard trailing Tiger by a mere 0.7%). Memory performance is where Tiger trumps both versions of Leopard: both versions of 10.5 are about 5.5% slower on Intel hardware. Of course, Geekbench only tests certain areas of performance, and graphic drivers under Leopard may make a big difference that Geekbench can’t measure. We have read several reports of people running Mac OS X 10.5 on G4 Macs slower than 867 MHz, even though the installer refuses to function on these systems (not even on the dual 800 MHz Power Mac G4). The only known solution at present requires that you have a supported PowerPC Mac (it may be possible using an Intel Mac, but we suspect that won’t work) and use that to install Leopard on a hard drive, take that drive to the unsupported G4 Mac, and boot from it. Field reports indicate this works with both external FireWire drives and internal IDE hard drives. We’ve also read at Macs Only! that an external drive with Leopard installed can be cloned to a G4 Mac’s internal drive (in their case, a pair of Power Mac G4 Cubes) using Carbon Copy Cloner, making it possible to use a single FireWire drive to get Leopard up and running on several unsupported Macs. We have not yet read any reports of Leopard being installed on unsupported hardware using FireWire Disk Mode and installing from a supported PowerPC Mac. Theoretically it should work. Anyhow, there are some issues with unsupported hardware. Engadget reports that while Time Machine will do backup on an AGP Power Mac (with a 1 GHz CPU upgrade), it can’t run the part of the program that lets you recover files. On that system, they also reported that DVD Player would not work, VLC was dropping a lot of frames, and Front Row wouldn’t function. Other than that, Leopard works.